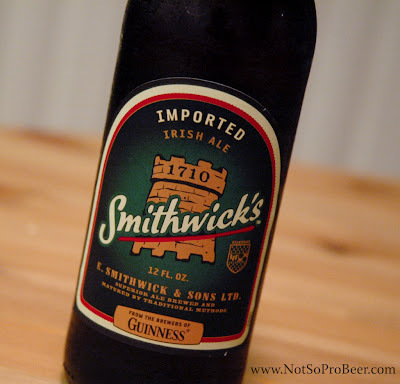 The Not So Professional Beer Blog: Review: Smithwick's, Guinness Ltd. Description: "The brewery at St. Francis Abbey in Kilkenny, Ireland has been in operation since 1710. Smithwick's is Ireland's oldest ale, inspired by John Smithwick's original recipe. This ale delivers distinctive amber color, full bodied taste and ultra-smooth finish." — Guinness Ltd.
Random thoughts: This is part of my tribute to St. Patrick's day—also known as Four Guinness and a Coors. I found this at Trader Joe's and have not seen it in other grocery stores. The tasting: Reddish-orange (very clear) with a fluffy white head that dissipated slowly, leaving lots of lacing on the glass. I don't recall seeing this much lacing in any of the beers I have reviewed so far! It's a very nice looking beer. Aroma of biscuit malts, yeast, and earthy hops. Flavor very similar to aroma with the addition of toasted malt. Hopping is very light. Light bodied and highly carbonated it has an effervescent mouth feel. It finishes dry with bready malt. Very drinkable. Rating: 3 star. Good. I would drink this again if someone gave it to me. If you plan to celebrate St. Patty's day with an Irish beer, you should consider Smithwick's. It's very light, drinkable, and a good session beer. It's also a great alternative to the stouts. 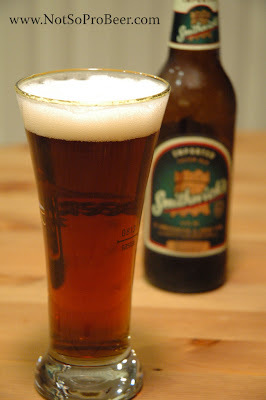 Have you tried Smithwick's or any other Irish ales? Fun review to do. St. Pat's is my favorite day to make my own black and tan. This is my favorite beer. It is even better right off the tap, out of a bottle really does not do it any justice. Great Blog!! Mark, I haven't had a Black and Tan in ages. I've never made one myself. Thanks for the idea! I'll give it try, maybe I'll write about it if works out. Gene, thanks for checking out the blog. Glad you like it! I'll have to try it in tap if I ever come across it. I probably never noticed it before. The first time I ever saw it was when I picked it up in the store. The key is using a Guinness in one of those special nitro cans with the "widget" in it. Trust me, I learned the hard way. I have a "turtle" that I bought that craddles the top of the pint glass. I pour the Guinness over the turtle, but the back of a spoon will do. Your favorite pale ale will do as the bottom beer. Mark, I tried to make a Black and Tan. 1st attempt wasn't so good. I'll master it by next St. Patty's Day!